Our Lady of the Angels blaze. Chicago, 1958. Documents #2. – Blog De Las Sombras. Mirror. Our Lady of the Angels blaze. Chicago, 1958. Documents #2. This post is mainly meant for english-speaking readers. – Confesses lighting wastebasket in Our Lady of Angels tragedy. – Judge Cilella gest report, plans action. 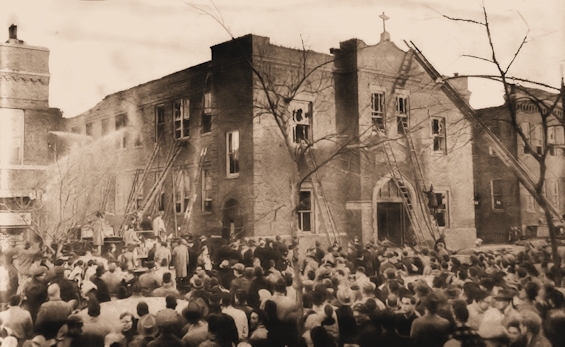 Information that a 13 year old boy has confessed setting the fire at Our Lady of the Angels school, which took the lives of 92 children and three nuns, was given yesterday to Judge Alfred J. Cilella of Family court. Judge Cilella promised an investigation of the report that the boy signed an eight page confession under questioning by John E. Reid, head of John Reid & Associates, 600 N. Michigan av., a nationally known expert on lie detectors.Cilella said that if the confession is found to be accurate, the boy should be taken into custody. Reid confirmed that he had talked with the boy Friday afternoon at the request of the boy’s parents and that he had given him a lie detector test. But Reid refused to comment on his findings. Cilella said he had been told of the confession by Reid yesterday. 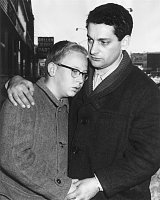 According to information obtained by The Tribune, the boy in his confession told of setting fire to the school about 2:45 p.m. on Dec. 1, 1958, causing a holocaust in which pupils and teachers died minutes before classes would have been dismissed for the day. The boy was among a group of 5th graders who were led to safety minutes after discovery of the fire, which trapped most of its victims on the second floor of the school at 09 N. Avers. av. The boy said he started the fire by tossing lighted matches into a cardboard waste barrel near a stairwell in the basement of the elementary school. He told Reid that he did so because he hated shool, rebelled at the authority of teachers, and liked to hear the sound of fire sirens and to watch fire engines race along the street. The Tribune was told that the boy, now an 8th grader in a west suburban school, admitted setting at least 12 other fires in Chicago and the suburbs, some as recently as last fall. He said he set his first fire when he was 5 years old in a garage near his home in Chicago. The confession last Friday to Reid ended a month and a half long investigation that started with an anonymous letter naming the boy as the person who set fire to an apartment building. Capt. Chris T. Rooney, Cicero director of safety, Lt. Victor Will of the Cicero police, Sgt. Drew Brown of the Chicago bomb and arson squad, and Policeman Ronald B. Richards, a juvenile office of Cicero, conducted the investigation. Suspicion that the boy might have been responsible for the school fire began to grow when investigation showed that he had been a pupil there at the time of the fire. He attended school there, however, under another name. At 2:45 p.m. on a cold and icy day, the boy asked permission to go to the washroom from his second floor classroom. At the time he was 10 years old. The boy, The Tribune was told, went to the basement of the school and looked into a chapel to make sure that no one was there. Then he approached the stairwell and saw a large barrel made of cardboard with metal rims which was used by the school janitor to colect waste paper. The boy reportedly told Reid that he threw several lighted matches into the barrel. He had obtained the matches at home when he went there for lunch. When flames flared from the paper filled barrel, the youngster said, he stood back, then returned quietly to his classroom. He mentioned the fire to no one. Had he, many lives might have been saved. When the fire was discovered and smoke began to filter thru the upper story of the old school building, the boy and five other pupils were trapped in the classroom with their teacher, he said. He related a dramatic tale of how the teacher hurled him from the window because he was too frightened to jump. This story was contradicted by the teacher, Miss Pearl Tristano, ? N. Grove av., Oak Park, now a teacher at Rosary college, River Forest. Miss Tristano led her class to safety shortly before the heat of the fire blasted thru the ceilings of the second floor classrooms and killed man of the children at their desks. After giving his confession to Reid, the boy reportedly drew a rough pencil sketch of the school. It showed his classroom -room 206- the stairwell where he set the fire, the staircase up which the fire is believed to have raced, the location in the basement where janitors kept supplied, and the waste paper barrel which he used to start the blaze. The boy said that after the fire he calmly walked to the home of a friend where a Cub Scout den meeting had been scheduled. He said he was told there by the friend’s mother that the meeting had been canceled because of the tragedy. Then, he said, he went home. In a several hour session of questioning by Capt. Rooney, Policeman Richards, Sgt. Brown and Lt. Will, the boy told why he had set many of the fires which he admitted. At this point, however, he denied having set the school blaze. At one point, he expressed sympathy for the lot of his teachers. “I can imagine being a teacher and having to get up every morning and thinking about having to go and face a bunch of kids all day,” he told Rooney. The boy did not make it clear whether his conflicts with teachers had occurred at the Our Lady of the Angels school or at another school. There were contradictions in the stories the boy told Capt. Rooney and Reid. Rooney said he was convinced the boy had invented a “friend” on whom he first tried to place blame for the tragedy. During the questioning by the Cicero officials, the youngster said that on the day of the fire he walked to school with a friend whose name he could not remember. “I didn’t think he would do it because he was a nice boy and had never been in trouble,” the boy told Capt. Roney. Rooney asked if the “friend” was real. Later, under questioning by Reid, the role played by the “friend” in the earlier story changed to the person of the suspect himself. He told Reid that at lunch time on the day of the tragedy, he walked back to school with a friend, after having obtained matches at home. He said he told his friend, a 4th grader, that he intended to burn the school down because he hated school and didn’t want to go there again. He said that he and his friend discussed murders, horror movies, and “things like that” the rest of the way to school. His friend, he said, survived the fire, too. Miss Tristano said she could not recall the boy being excused from class to go to the washroom. Miss Tristano disputed the boy’s story that he escaped the fire building by taking what he termed “a belly flopper” into a net spread by firemen. Reportedly, Reid had no knowledge at that point that the child had attended the Our Lady of the Angels school, but that the boy disclosed this fact thru questioning. “… The boy began describing to Reid how he had left his classroom on the afternoon in question, obtaining permission from his teacher to use the washroom. He had gone downstairs to the boy’s lavatory in the school basement. He said he had started the fire on the way back to his room, tossing three matches into a waste drum filled with paper at the bottom of the empty northeast stairwell. “… What is more, despite all the lies and deception and covering up, Cilella was convinced that the boy was guilty of starting the fire that killed my little sister and ninety-four others. He knew and admitted it to now-retired circuit court judge Christy Berkos, who was, at the time of the suburban apartment building fires, Cicero’s town attorney. Judge Berkos verified to me an interview he had given to a newsman a number of years ago. He told me that he had gone to the Cook County Juvenile Court, where a hearing was held in Judge Cilella’s court. He told me that the hearing lasted two days, at which time the judge called him into his chamber. Cilella asked Berkos what he was trying to prove. He told him that he was trying to prove that the youngster in court was very sick, that he had set the fire at the school and all the fires in Cicero, and that he was a danger to the community. Berkos then makes an astonishing assertion that will prove no only was Cilella’s decision pre-determined, but that the evidence adduced in court did in fact corroborate the boy’s confession. Otherwise, dear reader, how could the judge have come to the following conclusion? I think you’ve proven more than anything that he’s sick. I think it’s clear that he didn’t mean to kill anyone. He never expected that fire in the trash can to do what it did (more judge-made rationale). I’m going to send him out of town to a place where he can get the attention he needs. The judge then returned to court and gave Reid a dressing down for the way he had obtained the confession in the Our Lady of the Angels School fire. However, he accepted Reid’s confession from the boy in the Cicero fires and ordered the boy sent out of state. Everything could have been gained, including bringing a mass murderer to justice for the deaths of ninety-five innocent people. His real reason was to protect Daley’s already besieged archdiocese. School administrators had a duty to protect third persons in the name of public safety from the fire starter. A parent or one acting in locus parentis has a duty to protect his children from third persons but also has a duty to protect third persons from his children. “… The Archdiocese and the good Monsignor had the money, but their greed and arrogance left no room for compliance. The most glaring example of this ocurred on November 18, 1958, just two weeks before the massacre: The Catholic Bishop, on behalf of the Our Lady of the Angels Parish, purchased a useless piece of property at 825 N0. Hamlin Ave. The building, which once housed the B’Nai Zion Synagogue, was now on the market. 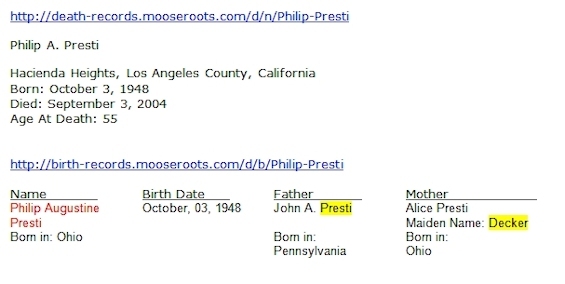 The boy who confessed to John Reid in 1962 was almost certainly Philip Presti d.o.b. 10/3/1948 and in 1958 his name was Philip Decker. He died 9/3/2004. Yes, the Church bears tremendous responsibility for the subsequent cover up and failure to bring healing and closure to the many who were victimized. It is also a strong possibility that this cover up led to the deaths of at least 4 more victims in another fire in Cicero. Do any research on the matter and you will find the cover up began immediately and deliberately. Apparently several students gave Philip’s name to investigators within days of the fire to no avail and Rev. McManus made no secret of the fact that his specific role was to keep the Diocese from being sued. He was rewarded for his successful efforts by being named a Bishop years later. The libel threat is a smokescreen. You cannot libel the dead. Even if it were against the law, you can can’t libel someone with the truth and any subsequent lawsuit just might bring the truth to light. I don’t think Philip Presti was sent to reform school, he lived his life, was a truck driver, had a family, his granddaughter 11-years-old was killed in a rock slide, one of his sons also died, Philip died of cancer in 2004. Yes I am posting his name, I do not understand why they won’t mention his name, if it’s to keep his family in the dark, oh well, all those other parents had to endure the loss of their children and didn’t get justice. Pinterest. 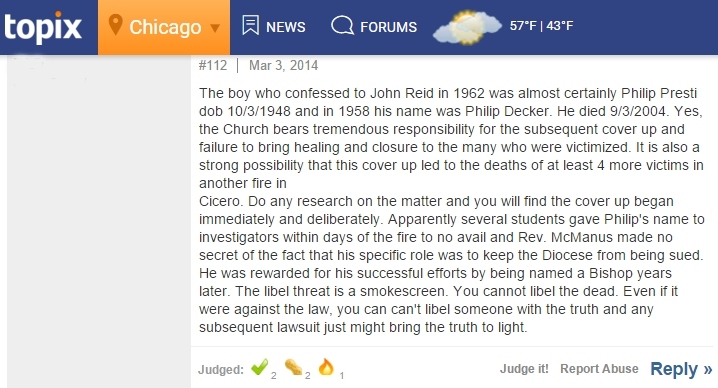 The boy who set the fire, Philip A. Decker, known now as Philip A. Presti. He died in 2004. “… Albert Gregory Meyer (March 9, 1903 – April 9, 1965) was an American prelate of the Roman Catholic Church who served as the Archbishop of the Archdiocese of Chicago from 1958 until his death in 1965, and was appointed a cardinal in 1959. Albert Meyer was born in Milwaukee, Wisconsin, to Peter James and Mathilda (née Thelen) Meyer, who were German immigrants. The fourth of five children, he had two brothers and two sisters; one sister became a nun. As a child, Meyer would pretend to say Mass with a toy altar and a glass of water for the chalice of wine. He received his early education under the School Sisters of Notre Dame at the parochial school of St. Mary’s Church. After attending Marquette Academy for two years, he entered St. Francis Seminary. In 1922, he was sent by Archbishop Sebastian Gebhard Messmer to continue his studies at the Pontifical North American College in Rome. On July 11, 1926, Meyer was ordained to the priesthood by Cardinal Basilio Pompilj, at the church of Santa Maria sopra Minerva. He then studied at the Pontifical Biblical Institute, from where he obtained a doctorate in Holy Scriptures in 1930. Upon returning to the United States, he served as a curate at St. Joseph’s Church in Waukesha until 1931, when he became a professor at his alma mater of St. Francis Seminary. He there taught religion, Greek, Latin, biblical archeology, dogmatic theology and Holy Scriptures. When Aloisius Joseph Muench was named Bishop of Fargo, Meyer succeeded him as rector of St. Francis Seminary in 1937. He was raised to the rank of Domestic Prelate in 1938, and also served as a chaplain and adviser to the Serra Club. On February 18, 1946, he was appointed the sixth bishop of the Diocese of Superior, Wisconsin by Pope Pius XII. Meyer was consecrated on the following April 11 by Archbishop Moses E. Kiley, with Bishops Aloisius Joseph Muench and William Patrick O’Connor serving as co-consecrators, in the Cathedral of St. John the Evangelist. Bishop Meyer became the seventh Archbishop of Milwaukee on July 21, 1953. He was installed as Archbishop of Chicago on November 16, 1958. When Meyer visited the victims of the Our Lady of the Angels School fire with then-Mayor Daley, he nearly collapsed with grief while visiting the hospital and morgue. Cardinal Francis Spellman, archbishop of New York, lent support by travelling to Chicago in the aftermath of this tragedy, and Pope John XXIII sent a telegram to Meyer. Chicago Daily Tribune. Tuesday, January 16. Boy admits school fire! ← Las tres niñas de Hilarión Eslava.